With a Top Ten debut single and a dedicated army of fans already under their belt, this year’s hottest girl band, PARADE are set to release their self-titled debut album, ‘PARADE’ on November 14th through Asylum Records. Dubbed “the UK’s most stylish new band”, the five pop starlets Lauren, Jessica, Sian, Emily and Bianca encompass everything that we love about great British girl bands - they’re fun, talented and radiate girl power sass with an unashamed love of pop music. Their debut album showcases all of the qualities that set the girls apart from anything else out there right now. 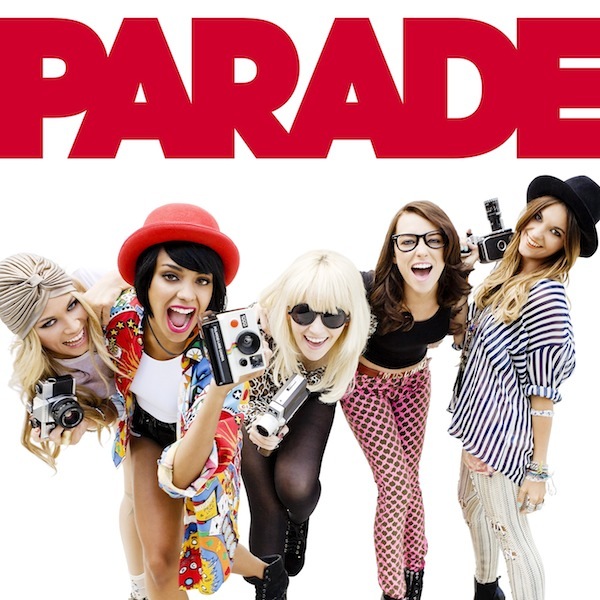 ‘PARADE’ the album is the perfect mixture of harmonised contemporary pop songs such as the heartfelt fan favourite 'Rokstar' and bouncy hit-in-the making, 'Like You' as well as BIG club tracks begging to be remixed; dance floor smashes 'Stars' and 'Rollercoaster' - it’s the perfect soundtrack to kick off a night out with the girls. Having already performed at the O2, Hammersmith Apollo and a host of other venues supporting the likes of Shakira, the Black Eyed Peas and Alexandra Burke, the girls have been busy showing off their assured dance choreography and vocal harmonies winning fans the nation over. Summer 2011 saw PARADE perform in front of huge crowds at The Isle of Wight Festival, V Festival and Wireless. They have also announced that they’ll be supporting mentor and ex Spice Girl, Mel C on tour in December this year. PARADE will also be taking part in the final ‘Live and Lost with BlackBerry®’ adventure in a few weeks time. Kicking off on Sunday 20th November on Channel 4’s T4, the tour will see the girls challenged to find their way to a gig hundreds of miles away having to rely on their fans to get them across the country, £20 and a BlackBerry®. The girls follow both Chipmunk and Rizzle Kicks by participating in the Live and Lost adventure. Their devotion to their fans has helped them amass a fanbase of dedicated ‘Paraders’ and ‘Paradettes‘ topping over 34,000 followers on Twitter and 3.9 million views on http://www.youtube.com/paradeofficial. Their debut single, ‘Louder’ stormed the midweek charts upon release in March - making PARADE one of only two British artists to debut inside the Top 10 at the time. So what are you waiting for? Join the PARADE.